Il Grande Piano è una grande tastiera installata a terra e suonata con i piedi; uno strumento musicale che unisce musica, danza, e coinvolgimento del pubblico . The “Grande Piano” is a gigantic keyboard installed on the ground and played with feet; an innovative musical instrument that combines music and dance. Suitable for any kind of event, it’s very entertaining and the audience is completely involved. Everyone can play it; children and adults can learn some melody through an amusing musical walk. La performance può essere effettuata in qualsiasi contesto, dalla strada al teatro, un centro commerciale oppure uno studio televisivo. 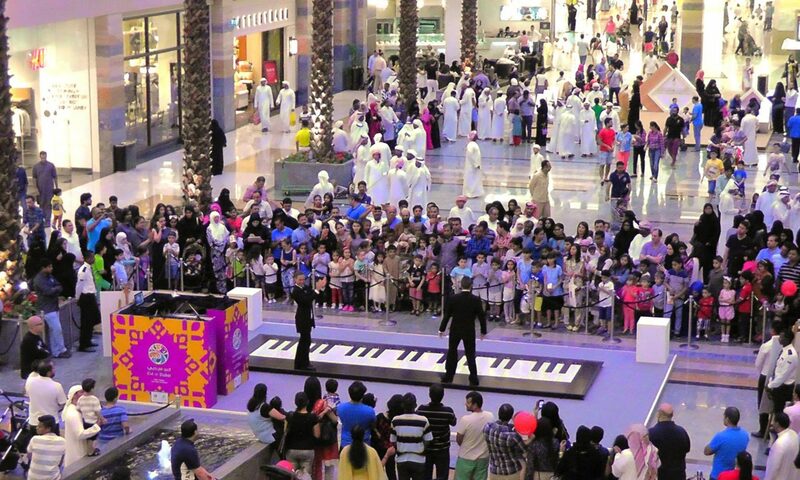 Performances can take place everywhere, from the streets to the theater, a mall or a television studio. Il Grande Piano nasce da uno spunto preso dal film “Big” dove Tom Hanks incanta i clienti del famoso negozio di giocattoli Fao Schwarz di New York. Il genio creativo di Manuel Benyacar del Faber Teatro è riuscito a ricreare uno strumento simile, di agevole trasporto e montaggio. Questo, unito alle capacità musicali di validissimi arrangiatori e all’abilità atletica ed artistica dei “piedopianisti” ha creato il fantastico insieme del GRANDE PIANO. “il Grande Piano” took inspiration from the movie “Big”, in which Tom Hanks charms the customers of the famous Fao Schwarz Toy Store in New York. The brilliant genius of Manuel Benyacar from “Faber Teatro” has succeeded in recreating such a tool, easy to transport and put together. This, combined with the musical skills of the most prestigious arrangers and the athletic and artistic ability of the “piedopianists”, has created the great team of “il Grande Piano”. Il Grande Piano ha base nel nord Italia; è disponibile per performance in tutto il mondo. The “Grande Piano” is based in Northern Italy and is available for performances in all over the world. Compila il FORM Alla pagina contatti e ti risponderemo entro 24h. Fill out the FORM on the contact page and we will answer you within 24h.